Nice to see Diane Kruger in a lead role, plus the film premiered in the Cannes competition. Becomes incrementally more stupid as each minute goes by. Kruger’s solid central turn is rendered null and void by the hacky, hyperbolic drama that surrounds it. Is it possible to separate a good performance from a bad movie? Can you surgically slice around it and toss away the excess? Or maybe engage in a form of selective myopia, where you just focus on the elements that you want to see, and ignore the unsightly stuff around it? 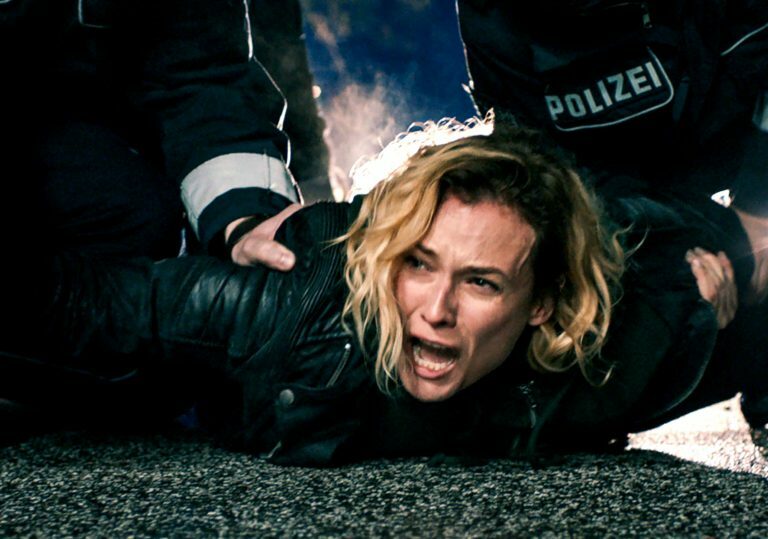 In the Fade, the latest from the prolific (but erratic) German director Fatih Akin, is quite awful as a movie, as a political statement, and as a nuanced piece of storytelling. However, it does have one ace up its sleeve, and that is Diane Kruger, who not only decides to invest her central character with a level of sensitivity that’s undeserving of this schlock material, but decides to run with a storyline which is, by turns, idiotic, offensive and, by the end, completely farcical. And farcical is not what you want when the intention is a stern state-of-Europe address on racially-motivated violence and an exploration into the unwieldy baggage of forgiving those who have sinned against us. Kruger plays Katja, an ex-drug addict married to a one-time dealer who has served time for his crimes. Now they have a precocious young scamp in designer specs and a legitimate business, one that nobly serves the local immigrant community of Hamburg. This ramshackle idyll comes tumbling down when a young woman on a pushbike drops a fertiliser bomb outside their shop front just as Katja is on her way out. The highs of familial harmony suddenly meet the lows of grief and desolation. Reasons to stick around on this mortal coil become more sparse by the minute. And then, at the very precipice of her pain, Katja is dragged back to sanity as the culprits are caught – now, at least, she can live to see them punished by the state for their atrocious crimes. The film’s mid-section bundles us into a stuffy courtroom where a pair of pasty neo-Nazis are in the dock, and it takes on the conventional tone of a teatime TV drama. Akin’s slipshod writing signposts where everything is heading, though during these scenes the film positively haemorrhages the small measure of credibility it had managed to accrue. In the knowledge that the film still has about 45 minutes left on the clock, it’s fairly obvious what happens next, and Akin duly obliges with a shock twist so laboured, you wonder why the cast and crew didn’t just down tools and dash for the exits. The English title, In the Fade, infers that Katja might be operating in some kind of moral grey area when she makes her subsequent life choices. Yet the reality is, this is little more than a female-fronted rehash of Death Wish dressed up in vaguely arty duds. It appears as if Akin’s intention may have been to pose a provocative conundrum about how best to deal with the realities of murderous xenophobia, but his decision to paint Katja as a morally tainted albeit righteous avenging angel lends it the feel of a retrograde polemic and an insidious endorsement of quid pro quo violence over compassion. Leaves an almost medicinally bitter taste in the mouth, this one. 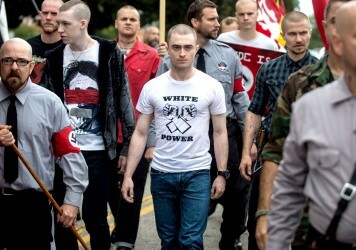 Daniel Radcliffe goes deep undercover in this thrilling neo-Nazi themed procedural.